The organization will host a free event in Reno, Nevada, on September 22, 2018, to assist cancer patients & caregivers in navigating cancer survivorship issues. 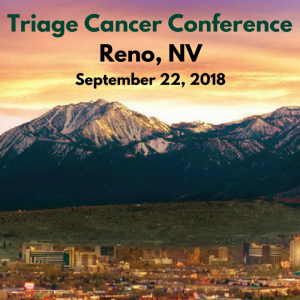 LOS ANGELES, CA, September 17, 2018 — Triage Cancer Chief Executive Officer, Joanna Morales, Esq., today announced the organization is hosting a free conference in Reno, Nevada, on September 22, 2018, to assist individuals diagnosed with cancer and caregivers in navigating practical cancer survivorship issues, beyond diagnosis. The Triage Cancer Conference will provide attendees with valuable information and practical tools to address issues that arise after a cancer diagnosis, such as how to: work through treatment or take time off; make health insurance choices; effectively use their health insurance to minimize their medical expenses; maintain their income using disability insurance; manage their medical bills and finances; make decisions around medical care and estate planning; and deal with other daily challenges that contribute to the financial burden of cancer. In an ever-changing environment, attendees will get the most up-to-date information on issues that may impact the cancer community. This event is free and open to the entire community. Nurses and social workers can also receive free continuing education units. For more information, please visit http://triagecancer.org/conferences.